This article is about Newburyport (disambiguation). For other uses, see Newburyport, Massachusetts (disambiguation). Newburyport is a small coastal city in Essex County, Massachusetts, United States, 35 miles (56 km) northeast of Boston. The population was 17,416 at the 2010 census. A historic seaport with a vibrant tourism industry, Newburyport includes part of Plum Island. The mooring, winter storage and maintenance of recreational boats, motor and sail, still contribute a large part of the city's income. A Coast Guard station oversees boating activity, especially in the swift tidal currents of the Merrimack River. The act was approved by Governor Francis Bernard on February 4, 1764. The new town was the smallest in Massachusetts, covering an area of 647 acres (2.62 km2), and had a population of 2,800 living in 357 homes. There were three shipyards, no bridges, and several ferries, one of which at the foot of Greenleaf Lane, now State Street, carried the Portsmouth Flying Stage Coach, running between Portsmouth, New Hampshire, and Boston. The town prospered and became a city in 1851. Situated near the mouth of the Merrimack River, it was once a fishing, shipbuilding and shipping center, with an industry in silverware manufacture. Merrimack Arms and Brown Manufacturing Company made Southerner Derringer pistols in their Newburyport factory from 1867 to 1873. 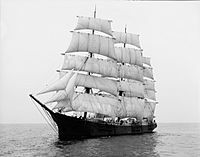 The captains of old Newburyport (as elsewhere in Massachusetts) had participated vigorously in the triangular trade, importing West Indian molasses and exporting rum made from it. The distilleries were located around Market Square near the waterfront. Caldwell's Old Newburyport rum was manufactured locally until well into the 19th century. Newburyport had never been comfortable with slavery. It had been a frequent topic of pulpit rhetoric. After the Revolutionary War, abolitionism took a firm hold. Several citizens are recognized by the National Park Service for their contributions to the Underground Railroad. The abolitionist movement reached a peak with the activities of William Lloyd Garrison, who was born in Newburyport and raised in its anti-slavery climate. His statue stands in Brown Square, which was the scene of abolitionist meetings. George Whitefield, the well-known and influential English preacher who helped inspire the First Great Awakening in America, arrived in Newburyport in September 1740. The revival that followed his labors, brought into existence Old South Church, where he was buried after his death in 1770. 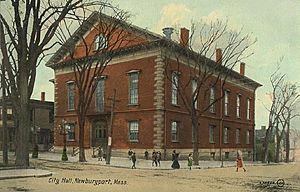 In 1854, located on 63 State Street, was founded the Newburyport Five Cents Savings Bank, one of the oldest still functioning American banks. Was referred to in the H. P. Lovecraft story, "The Shadow Over Innsmouth", as being located near Innsmouth. Lovecraft in fact based his depiction of Innsmouth largely on Newburyport. Despite its former prosperity, in the 1950s and 1960s Newburyport's center fell into disrepair because of several factors, most notably strip malls taking away from local business and increased use of the automobile. At this time, construction of major highways brought larger cities such as Lawrence and Lowell into shopping range. Consequently, by 1970 Newburyport's historic downtown section was scheduled to be razed prior to reconstruction with federal money. Ideas to rebuild the city's downtown were numerous, ranging from hotels and new stores to, ironically, a strip mall, with few buildings left for historical reasons. At the last moment, however, the city changed its mind and signed a federal grant that allowed it to keep most of its historic architecture. Renovation and restorations began during the early 1970s, and continued throughout most of the decade, initially along State Street, and culminating with creation of a pedestrian mall along Inn Street. Newburyport is often cited as an example by preservationists of how to maintain a city's architecture and heritage, while still having it remain functional and liveable. State Street c. 1906. Except for the trolley, the store fronts, and the pavement, the street has not changed. 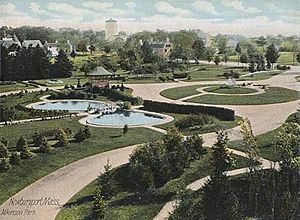 Frog Pond c. 1905. High Street is visible in the background. The building in the center is the old court house. Joppa Landing c. 1906. The boats are fishing dories. The houses remain but the landing and the boats are gone and the street has been improved. Hunter in the Meadows of Old Newburyport, Massachusetts, ca. 1873, Alfred Thompson Bricher. The scene appears to be in the vicinity of the Little River. Route 1 offered the major overlook easily accessible to artists. In the far right can be seen the ridge of the right bank of the Merrimack over which High Street runs. Cattle have been turned into the marsh for pasture, a practice still allowed on some marsh farms of the area. Newburyport is located at (42.812391, −70.877440). According to the United States Census Bureau, the city has a total area of 10.6 square miles (27 km2), of which 8.4 square miles (22 km2) is land and 2.2 square miles (5.7 km2) (20.77%) is water. The city is part of Massachusetts' North Shore; Newburyport was laid out on the elevated south bank of the Merrimack River between the river and Newbury marshes. The shipyards, now boatyards (and still vigorously active), extended along the bank at the edge of the river. They were connected by Merrimac Street, which ends upriver where the bank merges into bluffs covered with pine forest. Colonial residences extend up the bank from Merrimac Street to High Street running parallel to it near the top of the ridge. The homes of the seafaring entrepreneurs line High Street. Many feature widow's walks, structures on the roof where the residents could watch for the return of sailing vessels. Nearly every home maintains a splendid flower garden, most dating to colonial times. 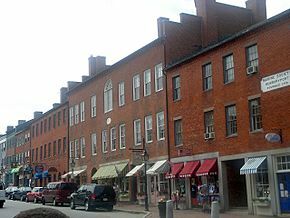 Various cross streets, such as State Street, Green Street and Market Street, connect Merrimac Street and High Street. The top of the ridge proved an ideal location for later institutions, such as Newburyport High School and nearby Anna Jaques Hospital. The ridge drops more sharply to the marsh on the other side. Along its margin a third parallel street developed, Low Street. The river bank gradually descends to marshes at Joppa Flats beyond downtown Newburyport. The Plum Island Turnpike was pushed out over the marsh on a causeway to a narrow part of the Plum Island River just to the south of where it connects to the mouth of the Merrimack. A drawbridge was built there, the only access to the island by road. On the Newburyport side a small airport, Plum Island Airport, was built at the edge of the marsh. The portion of Plum Island that is in the city has no direct access to the rest of the city; similarly, there is no access between the mainland and Woodbridge Island or Seal Island, west of Plum Island (the latter being shared between Newburyport and Newbury). Several parks and beaches dot the city, including Plum Island Point Beach, Simmons Beach, Joppa Park, Waterfront Park, Woodman Park, Cashman Park, Moseley Pines Park and Atkinson Common and March's Hill Park. Newburyport Forest is located in the southwest corner of the city, and Maudslay State Park lies along the northwest part of the city, along the banks of the Merrimack. Newburyport is located 37 miles (60 km) north-northeast of Boston, 19 miles (31 km) east-northeast of Lawrence, and 21 miles (34 km) south-southeast of Portsmouth, New Hampshire. 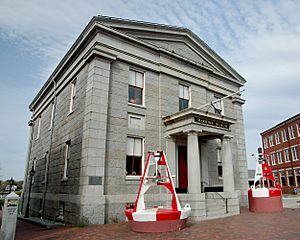 Situated 5 miles (8 km) south of the New Hampshire border, the city is bordered by the Gulf of Maine (Atlantic Ocean) to the east, Newbury to the south, West Newbury to the west, Amesbury to the northwest, and Salisbury to the north. Brown Square in 1913, viewed from before the City Hall. The statue is that of "Garrison the Liberator". The houses and church still stand but the street has been paved and more modern buildings inserted. There were 7,519 households out of which 25.9% had children under the age of 18 living with them, 47.7% were married couples living together, 8.5% had a female householder with no husband present, and 41.1% were non-families. 33.1% of all households were made up of individuals and 9.7% had someone living alone who was 65 years of age or older. The average household size was 2.24 and the average family size was 2.90. City Hall c. 1910. The building looks about the same today. It was constructed 1850–1851. The corner of Brown Square is visible across the street. The view is from where the Post Office now stands. In the city, the population was spread out with 20.7% under the age of 18, 4.4% from 18 to 24, 32.7% from 25 to 44, 28.2% from 45 to 64, and 14.0% who were 65 years of age or older. The median age was 41 years. For every 100 females there were 86.7 males. For every 100 females age 18 and over, there were 82.9 males. The median income for a household in the city was $78,557, and the median income for a family was $103,306. Males had a median income of $51,831 versus $37,853 for females. The per capita income for the city was $34,187. About 2.8% of families and 5.2% of the population were below the poverty line, including 4.5% of those under age 18 and 6.9% of those age 65 or over. Interstate 95 passes through the western side of town, with one exit at Route 113. Route 113 itself has its eastern terminus at U.S. Route 1 and Massachusetts Route 1A, with Route 1A continuing along the same right of way as 113 towards Newbury. Route 1 and 1A cross the river along the Newburyport Turnpike Bridge; it had originally followed State Street and ended at Merrimac and Water streets before crossing the river via ferry to Salisbury. The Turnpike Bridge is the easternmost crossing of the Merrimack; upstream the river is crossed by the Newburyport Railroad Bridge (just west of the Turnpike Bridge), the Chain Bridge, one of the oldest bridges along the river, and the Whittier Memorial Bridge, which brings Interstate 95 to Amesbury. The Merrimack Valley Regional Transit Authority provides regular bus service between the city and Haverhill and operates a summer shuttle from the Newburyport commuter rail station and downtown Newburyport to Plum Island Point. Both services cost $1.25 for adults paying cash or $1 for adults paying with CharlieCard. C&J and Coach Company, privately-operated coach carriers, operate commuter bus services between Newburyport and Boston. Newburyport is the northern terminus of the Newburyport/Rockport Line of the MBTA Commuter Rail system, providing access through several North Shore cities to Boston's North Station. Plum Island Airport is a privately owned general aviation airport located within the city limits. It is open to the public and managed by Plum Island Aerodrome, Inc., a not-for-profit organization. The nearest scheduled commercial air service can be found at Boston's Logan International Airport. Newburyport makes several types of activities available for its residents, including a year-round ice skating rink and a beautiful waterfront and boardwalk. Newburyport residents are known to love boating, fishing, swimming, and other water sports. The city's picturesque downtown shopping district also makes it a great location to enjoy boutique shopping. The city sponsors several youth sports leagues, including baseball, football, soccer, lacrosse, basketball, and hockey. The city's youth services program also provides classes, campouts, and activities in robotics, music, rock climbing, chess, fencing, sewing, dance, skateboarding, judo, academics, cooking, yoga, cheerleading, art, fashion design, photography, biking, and frisbee. Yankee Homecoming, run not by the city, but by the non-profit Yankee Homecoming, Inc., is the annual festival celebrating the natives coming home to Newburyport. The event was initiated in 1957 by native Newburyporter George Cashman, who sought to stimulate the economy and lift the spirit of the citizens. It lasts one week. The first Sunday of the festival, known as "Olde Fashioned Sunday", is celebrated at the Bartlet Mall in Newburyport, and features many activities, including an art show, an appearance by the city's oldest fire engine, the "Neptune #8", and the participation of many local businesses. There is also an antique car parade. Each Yankee Homecoming features a grand marshal and numerous street vendors. The festival includes eight days and over 200 events. There are concerts every night at Market Landing Park. Other popular events include the Newburyport Lions' 10-mile (16 km) and 5-kilometer road races, which run through the city's downtown streets and neighborhoods. There is also a 45-minute fireworks show on Saturday night, which is followed the concluding Sunday by the famous Yankee Homecoming parade. Newburyport's "Yankee Homecoming" is the second oldest homecoming festival in the United States. Many charities raise their funds during this time. The Yankee Homecoming Festival celebrates its 53rd year in Newburyport this year. Held Friday evenings in Waterfront Park in downtown Newburyport, these free concerts are intended for all ages. The concerts are presented by the Newburyport Chamber of Commerce and the Waterfront Trust and are sponsored by a local insurance agency, Arthur S Page Insurance. Held during the last weekend of April, the Newburyport Literary Festival was started in 2006 as a new effort by the city to increase interest in reading and literary arts. Many local authors are invited to sign and chat about their book, and schoolchildren create projects to show to an author who visits their school. Among the authors who regularly visit are Andre Dubus III, Tess Gerritsen and Rhina Espaillat. Over the years, the town has cultivated a significant tourist population. The quaint downtown shopping center includes businesses that appeal to all ages. Local businesses and restaurants surround Market Square and along State Street. During festivals throughout the year, visitors are invited to enjoy concerts, food, and entertainment. An old mill building on Liberty Street is home to other small businesses and a local farmers' market during both the summer and winter seasons. The historic area has a charming feel and upbeat atmosphere. High Street is a remarkable street of fine old Federal-style houses, linking the Atkinson Common (1893–1894) with the Bartlett Mall, site of the Charles Bulfinch-designed Essex County Superior Courthouse (1805). Laid out in 1801, the Bartlett Mall was redesigned in the 1880s by noted Boston landscape architect Charles Eliot, with later improvements by Arthur Shurcliff. First Presbyterian Church dates from 1756. The clock tower bell was cast by Paul Revere. One of the most famous individuals in 18th-century America, evangelist George Whitefield, before dying in Newburyport in 1770, asked that his remains be buried under the pulpit of the "Old South" church, and they are there to this day. 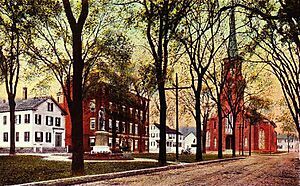 Some other points of interest are the city's historic waterfront, Atwood Park located in the south end of Newburyport, Market Square & Inn Street, Cashman Park, and Brown Square, graced with a statue to "Garrison the Liberator", before the City Hall. The recently restored City Hall itself is a fine old building featuring in the first floor corridor a portrait gallery of some of those who have fallen in service of their country. Others are listed on the central monument in Atkinson Common. 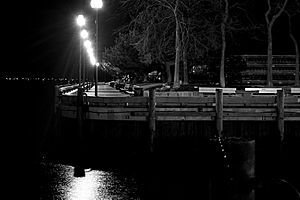 Newburyport was the inspiration for the city of Innsmouth, the setting of the H. P. Lovecraft story The Shadow Over Innsmouth, part of the Cthulhu Mythos. The narrative also cameos the actual Newburyport in the first chapter. It is where the protagonist sets out from on his journey to Innsmouth. 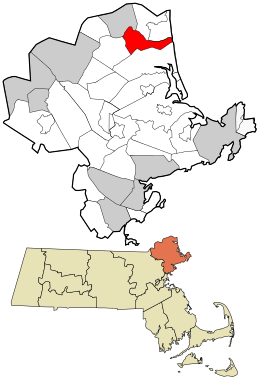 Newburyport, Massachusetts Facts for Kids. Kiddle Encyclopedia.